You Are Invited To Get Tough On Cancer! Join us in the fight to end blood cancer! We are proud to partner with the Leukemia & Lymphoma Society’s Students of the Year team, “Wolf Pack: Hunting for a Cure” to raise money for the Leukemia & Lymphoma Society. 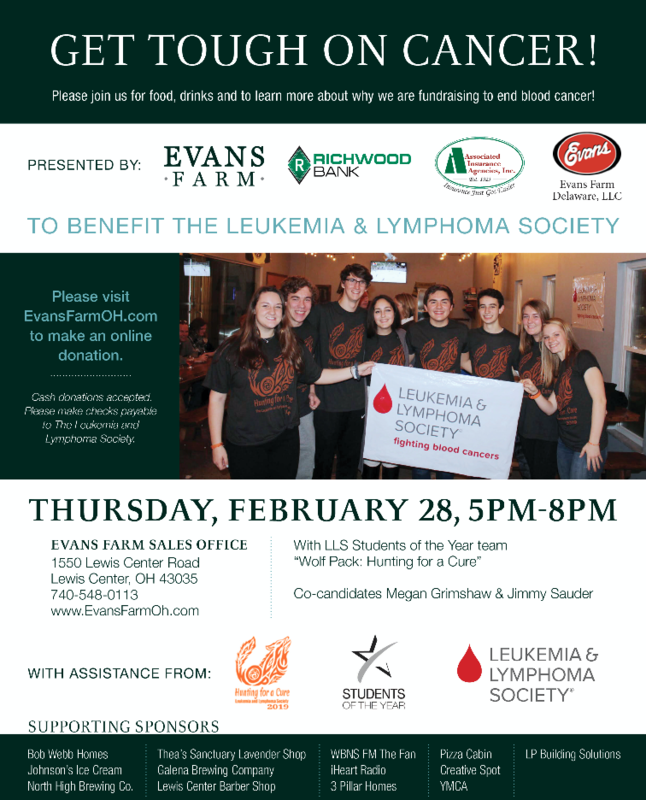 Enjoy food and drinks from our sponsors and learn more about why we are fundraising to end blood cancer. Click here to donate online. Cash and checks also accepted. Please make checks payable to The Leukemia & Lymphoma Society. Presented By: Evans Farm, Richwood Bank, and Associated Insurance Agencies Inc. Supporting Sponsors: Bob Webb Homes, Johnson’s Ice Cream, North High Brewing Co., Thea’s Sanctuary Lavender Shop, Galena Brewing Company, Lewis Center Barber Shop, WBNS FM The Fan, iHeart Radio, 3 Pillar Homes, Pizza Cabin, Creative Spot,YMCA, LP Building Solutions, Terrain Evolution, and Self Park.